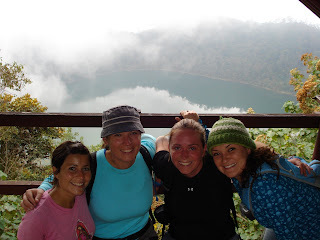 Last month Marissa, Kelly, Carolyn and I hiked up Volcán Chicabal. 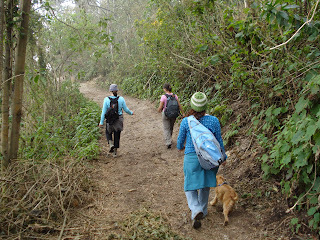 It is an extremely short hike, only about 45 minutes to the top, with some beautiful scenery. Kelly rightly observed that with the cold climate and thick vegetation it was extremely similar to the rain forests of British Colombia. 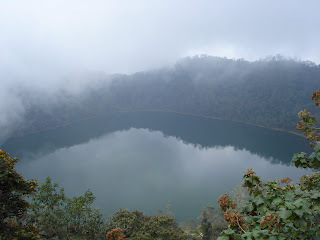 The crater of Chicabal contains a lake sacred to the Mayans. 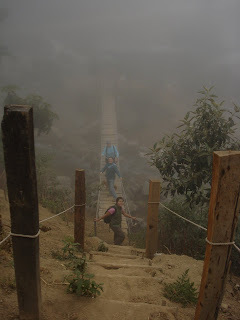 For this reason, you are not allowed to swim in it once you reach the top, but it is a little too cold for swimming anyway. Sitting at the summit looking down into the lake, or walking around the shoreline, you can imagine why the lake holds such religious significance. The rolling fog brings the lake in and out of focus giving it a mystical quality. Although we were able to witness a few Mayan ceremonial activities, we’ve been told the first week of May attracts thousands of Mayans to the lake, but outsiders are generally not allowed in the park at this time to avoid interference. I'll be spending 2 years in Guatemala with the Peace Corps. Save the page if you're interested in looking at my pictures.